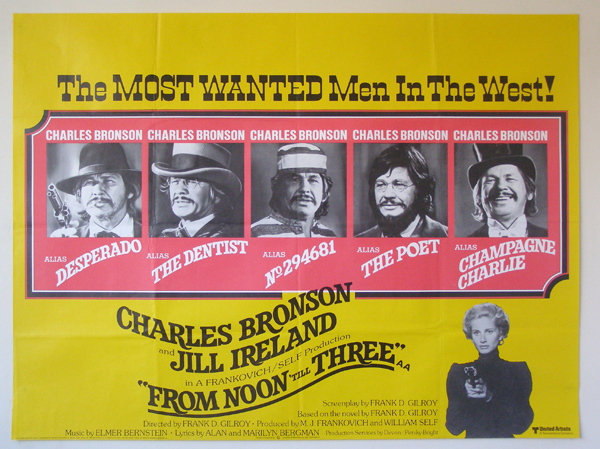 Starring: Charles Bronson, Jill Ireland, Douglas Fowley, Stan Haze, Damon Douglas. From Noon Till Three isn’t the most remarkable westerns ever made but it’s certainly one of the most curious. It doesn’t play out like a traditional western, more like a light romantic comedy where the plot doesn’t really kick in until half way through the picture. 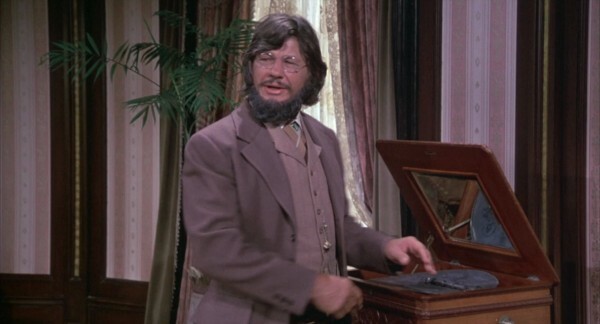 It also has Charles Bronson in self-mocking mood. Something we haven’t seen before. A gang of outlaws are heading into a small town to rob the bank. They are, however, one horse short and on their way, they stop off at a house belonging to widow Amanda to see if they could borrow one. She refuses and so the gang leave one of their own behind, Graham Dorsey. Agreeing to be picked up on their way back in three hours, Graham gets to spend the time with Amanda. Slowly the pair start to fall in love. Meanwhile, the gang have all been killed save one. Dorsey heads into town to stop a hanging and on his way, meets a dentist who he swaps clothes. The dentist is mistaken for Dorsey and is killed while Dorsey is thrown into jail, mistaken for the dentist who had been stealing gold teeth. In that time, Amanda writes a book about her three hour affair which is going to ruin Dorsey’s world forever. Now you might be saying to yourself, that’s a lot of plot been given away there but, trust me, it’s not. The real story as far as I’m concerned begins after this. Which is why this film is so fascinating. Writer/director Frank D. Gilroy seems to have a simple idea but decides that a romance between an outlaw and a wealthy widow isn’t enough to keep the viewers interested. He decides to throw in a secondary story that is far more interesting that the initial tale. The other thing that makes this an unusual western is that, take away the horses and cowboy hats and this could have been set any time. It doesn’t rely on any of the usual western trappings: no gunfights, no cattle, in fact nothing that would immediately make you recognise the genre. 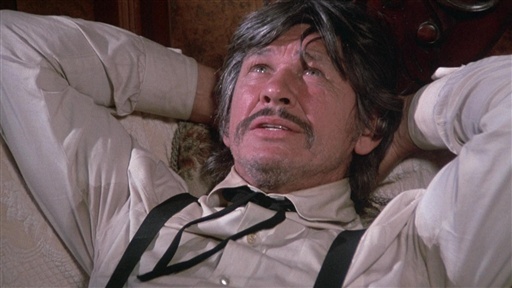 It’s also an unusual choice of film for the usually rough and violent Charles Bronson. Bronson’s career as a tough guy was really on show during the period this was made, the 70s. With films like Death Wish, Chato’s Land, The Stone Killer under his belt, to see him playing light and mocking his own persona is certainly something unexpected. It’s nice to see Bronson having fun, dressing up in a variety of costumes and even wearing a false beard! Joined for the thirteenth time by his wife, British actress Jill Ireland, even she rises for the occasion. Not the greatest actress around, she is sufficiently aloof as the widow who falls for Bronson’s charms. The chemistry between the pair works better here than in most of their films, usually because Bronson has to play cold-hearted killer than fun-loving outlaw. This was to be Bronson’s penultimate western, his last being The White Buffalo a year later but I actually think this is one of his best. Mainly because it is such an unexpected move for a man who made his career out of violent thrillers, most of which, in later years, weren’t very good. It’s a shame within his career he didn’t make more comedies or lighter pictures. It’s always nice to see someone reknowned for one genre trying something different. Flawed as it is, it’s still an enjoyable romp which becomes even more interesting once the secondary plot takes off. It could have had a whole movie to itself if Gilroy had the good sense to create it.